A sticker on your food claiming that it's sterilized should be reason enough not to eat it. However, first class on Cathay Pacific airlines has delicious looking chicken from Hotel Mandarin Oriental in San Francisco. Not bad, huh? The thing on the left is supposedly "rice porridge" but we would all be much happier with the meal on the left. Passengers in first class can preorder a special meal from the airlines "Book The Cook" program so that they always get their first choice. If the brown goop on the left isn't enough to turn you off, try to identify the "vegetables" on top of the rice. On the other hand, first class offers Koura-yaki, a Japanese specialty, that looks fancy and intriguing. What are they even serving in economy class? With British Airways, you should definitely go first class, because these two salads and wine are only the appetizer! You'd think it would be hard to mess up a sandwich, but the cucumber cheese combo here looks pretty disgusting. The appetizer set up in first class is definitely more like it. They may give you a lot of food in economy class, but that definitely doesn't mean it tastes good. The sushi they give you in first class makes you feel like you're at a restaurant, not in a tiny airplane seat. While it's nice to include shrimp in the economy class meal, Delta's first class meal looks much more appetizing with cooked shrimp and yummy rice. What is that heap of jelly in the corner? No thanks. While economy isn't very promising, KLM's first class menu looks pretty good! Generally it's better if bread isn't served in a sealed bag, but at least the pasta looks semi-edible. Aegean's first class service has the bread outside the bag, and even adds a nice side of fresh cheeses with a delicious salad. This is a close one. While the economy class meal is presented neatly and has variety, the first class meal has fresh salmon. Maybe with Thai Airways you could fly either class for a good meal. Looks like Air France has got it down with their huge baguettes for economy class and steak for first class. Now that's service! 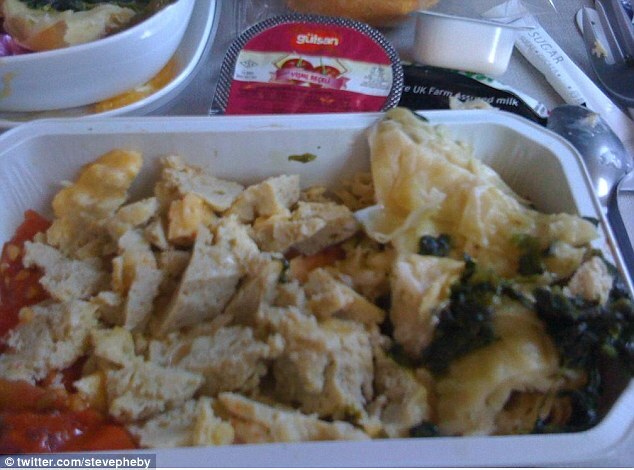 There's a huge difference between the plastic-wrapped unidentifiable meal in economy class and the fresh tuna in first class. Whatever is being served on United in economy class should not be considered food. First class however shows some decent looking chicken, bread, and rice.